India beat Pakistan to win Women's Asia Cup T20 for their sixth title in as many editions in Bangkok on 4th December 2016. It was the second time that India got the better of Pakistanin the competition, having beaten them by five wickets in the league stage besides remaining unbeaten in five games en route to the final. It was also a sweet revenge of sorts for India, who had lost to Pakistan during the World T20 at home in March. Recently, the ICC had docked them six points for not playing Pakistan. 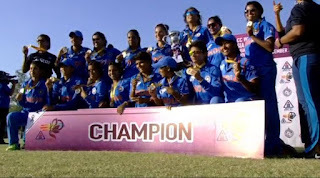 With the memorable win, India also managed to maintain their enviable record in the continental event, having won all the six editions to have taken place so far.